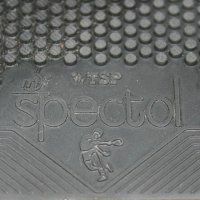 TSP Spectol Short Pips Table Tennis Rubber. 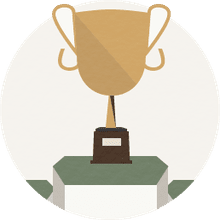 © 2007 Greg Letts, licensed to About.com, Inc. Guest author Ray Arditi shares what he has learned about how to use short pips table tennis rubber successfully. I'm a table tennis coach, and I use short-pips (Spectol) on my backhand and inverted on my forehand. I was fortunate to train with Lily Yip, USA Team Leader, and Mr. Kim of the Sky TTC in Yongin City, S.Korea. They taught me many things about using short-pips. A more aggressive mind-set: There is a difference in the mind-set. If you are a short-pips attacker you must be very aggressive and you must have fast hands; otherwise, the short-pips won't be suitable. Basically, you must attack close to the table because if you move away from the table your inverted opponent will overwhelm you with spin. Furthermore, you should be super-aggressive and keep pushing to a minimum. The strategy is to attack first; otherwise, your opponent will have too strong an advantage if you let him spin the first ball. "Cat and mouse" tactics: Very effective. Usually I try to drive my opponents away from the table with penetrating backhand drives. Then when they fade off the table in hopes of delivering ferocious mid-distance loops, I change up with soft-blocks (similar to a drop shot) to draw them into the table. Then if they come into the table, I drive strongly to push them off the table once again. The importance of hitting, not spinning: The first skill to learn is to hit through the ball. I snap my wrist back for power and then go straight through the ball following through with my wrist and rackethead. This produces a relatively spinless, direct kind of dead ball (that inverted players don't enjoy). Also, these shots have a low trajectory and tend to skim off the table very flatly. Importance of solid blocking skills: I spend a lot of time practicing my basic backhand block, so I'm able to block consecutive loops (also hopefully a decent percentage of smashes.) Then later you can learn the more advanced: a soft- block, knuckle ball block, punch-block, side-spin block, and chop-blocks. The short-pips chop-block is deadly and wonderful weapon to use against mid-distance loopers. Spinning is possible, too: A backhand loop can be produced against underspin, but it's not as spinny as an inverted loop so it must be placed strategically, or it may get wiped out. Ha! Most pips-out players use the backhand loop just as an opening shot which they will follow up with powerful, spinny forehand loops. Good for serving: Greg, I play in Korea and most of the inverted players (penholders) don't like receiving short-pips serves. The lack of spin and slower bounce, especially when kept low, seem to bother them. Many of the serves are misjudged. The high toss short-pips serves seem to get good results, especially short serves, close to the net. Excellent for hitting and smashing loops: However, the different short-pips rubbers have different characteristics, so my experience is mainly with Spectol. Yes, Spectol in the hands of a skilled player is a loop killer.